Are you looking for Dune Dervish (lore) connected with the Beastmaster of Caldeum achievement? The Dune Dervish is a large, powerful monster found in the desert areas of Act II. Dervishes launch into a spinning Whirlwind attack, during which they deal heavy damage and also slow anyone caught up in it. This makes them very difficult to assail during their spinning mode, increasing the pressure on players to get their attacks in during the Dervish's quiescent phase when it is largely harmless. 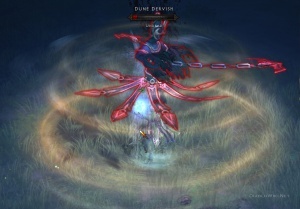 One of the more powerful monsters found on the surface of the Act 2 desert, the Dervish moves slowly and absently, seldom coming directly at the player. It waits to be attacked, and when a player closes to within range it launches into a whirlwind attack, spinning around, dealing heavy damage and knocking back any enemies in melee range. The Dervish is also capable of reflecting many types of projectiles while it spins, making it difficult for artillery characters to damage. A Dervish in no-spin mode. The key to killing a Dervish is to stand back until it comes out of the spin, when it is vulnerable. A wise player will then quickly close in and hit it fast and hard, since it will begin spinning again after a couple of seconds. All types of spells will hurt the Dervish when it is not spinning, but when it is many projectiles are reflected away. These projectiles are still damaging; they can hurt other monsters, but they will not touch the Dervish while it is spinning. Some spells can hurt the Dervish, though it's not always clear which. The Wizard's Magic Missile and Arcane Orbs are reflected away, but Electrocute hits the Dervish just like it would any other monster. Dervishes have very large footprints, and can be hit by multiple spells at once. Witch Doctors have great success against the Dervish with Plague of Toads since the Dervish is so large that 2 or 3 toads from each cast will strike it. Charged Bolt is also effective, for the same reason. Neither of these spells is reflected away, either, perhaps because they are ground-based, rather than floating? 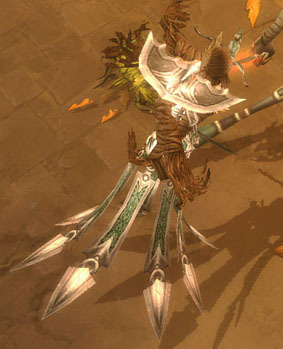 The Dune Dervish was first seen in August 2009 in the GamesCom 2009 demo build. It's interesting Blizzard added a "dervish" type monster, since they originally talked about a Dervish class. The name might have lent itself to this monster, though the term "dervish" to describe a spinning individual is in fairly common usage. In a piece of concept art, the Desert Dervish is referred to as a "Dune Dervish"..
Concept art of "Dune Dervish". This page was last edited on 22 April 2014, at 12:41.